This is our reference NY-17065. 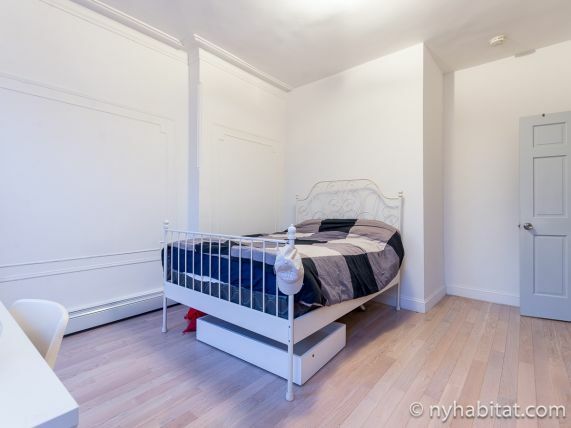 As a local Brooklynite, you will have a real New York experience in Bedford-Stuyvesant. 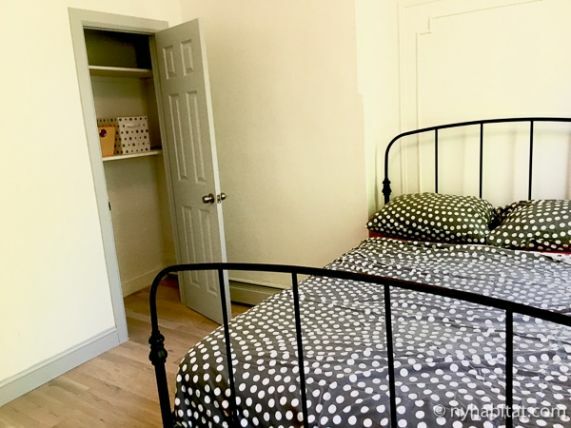 Rent a room in this five bedroom apartment share to really become a part of the neighborhood. 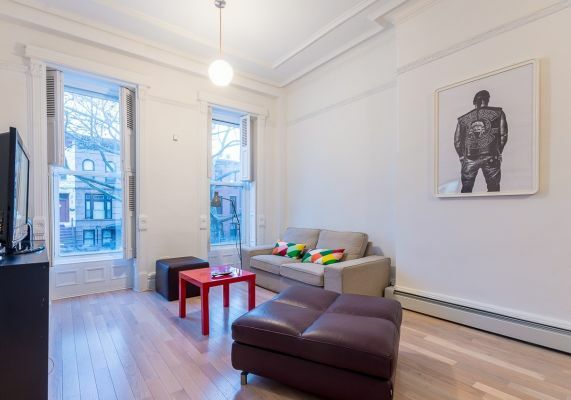 This duplex apartment near Jefferson Avenue and Patchen Avenue is on the parlor and top floor of a classic Brooklyn Brownstone. 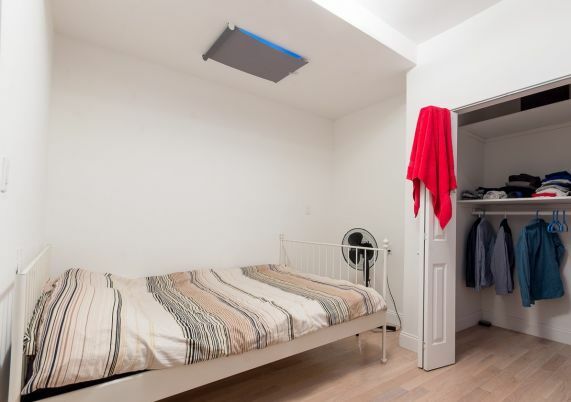 Please note: These are rooms for rent in a shared apartment. The bedroom is private, but the living room, bathroom, and kitchen will be shared with other roommates. Turn into the living room off of the hallway that features light colored hardwood flooring, crown molding, and contemporary furnishings. Looking out of the two windows, a view of the tree lined street can be seen. 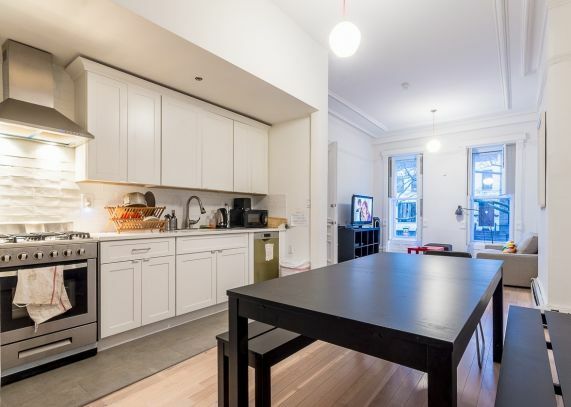 Across from the dark hardwood dining table and bench seating, the open kitchen allows for prepping meals in style. With stainless steel appliances, white cabinetry, and a dishwasher, this kitchen can suit everyone from the beginner to the culinary enthusiast. As for the bedrooms, all follow the style and flow of the duplex. Bedroom 1 is the only bedroom on the second floor. It contains a double sized bed, detailing for character and a window for natural light. On the top floor are the rest of the bedrooms. Bedroom 2 has a twin sized bed with a small desk overlooking the window. Bedroom 3 styles a wire bedframe with storage underneath, usable desk, two windows, and a dresser. Bedroom 4 offers a queen sized bed, closet space, and a skylight. Finally, bedroom 5 has two windows, a double sized bed, and a small closet with shelves. 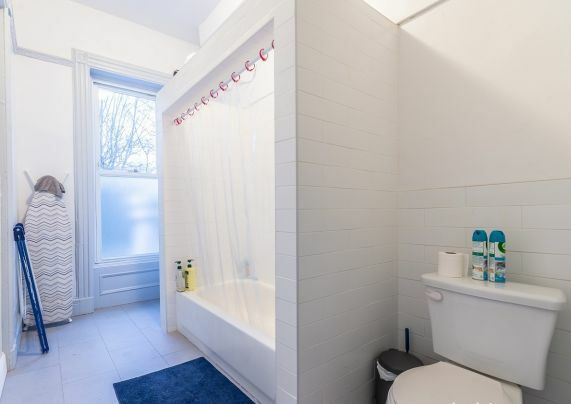 There is a shared bathroom on the first and second floor with a tile outlining the bathtub/shower combination, WC, and a frosted glass window. From Bedford Stuyvesant, getting to other parts of Brooklyn or around NYC is simple. Take the J or Z train from Gates Avenue / Broadway (0.6mi/900m) or the express A or local C trains at Utica Avenue / Fulton Street (0.6mi/950m). All bedrooms have utilities and weekly Cleaning included.